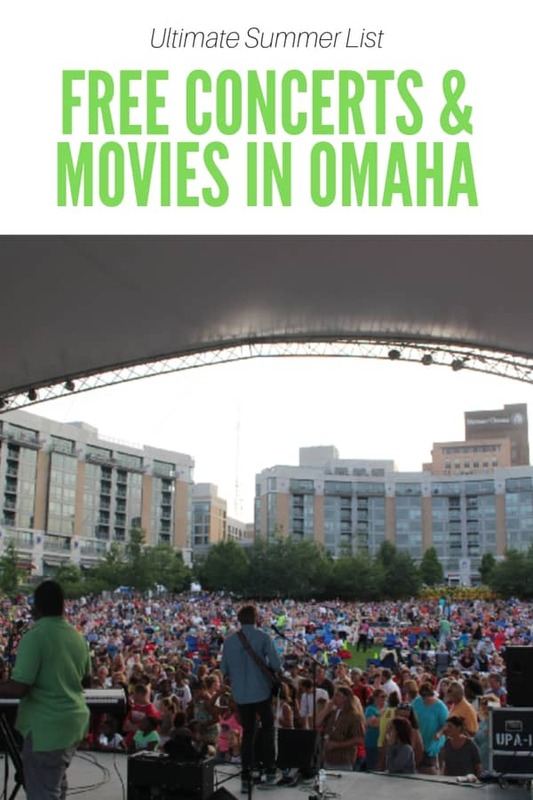 If there are two things Omahans love, it’s FREE movies and FREE concerts. That’s the only explanation I’ve come up with as to why we have so many of them this summer. So if you’re looking for free summer movies in Omaha, you’re in the right place. And if you’re looking for free summer concerts in Omaha, you’ll find the days and times here, too. Every week this summer, you’ll find concerts and movies for families and some you’ll want to find a babysitter before heading to. And, you’ll find live music and big screens are set up in every corner of the metro area! Assume most locations are in Omaha unless otherwise noted. May 18 – Saturdays @ Stinson featuring Recaptured: A Journey Tribute, Stinson Park at Aksarben Village, 7 p.m.
May 19 – Acoustic Sundays Music featuring Dale Thorton, Soaring Wings Vineyard, Springfield, Neb., 2 p.m.
May 25 – Saturdays @ Stinson featuring Finest Hour, Stinson Park at Aksarben Village, 7 p.m.
May 26 – Acoustic Sundays Music featuring John Worsham, Soaring Wings Vineyard, Springfield, Neb., 2 p.m.
June 1 – Sounds of Summer featuring Pink Kadillac, Shadow Lake Towne Center, Papillion, Neb., 6:30 p.m.
June 1 – Saturdays @ Stinson featuring Joystick, Stinson Park at Aksarben Village, 7 p.m.
June 2 – Acoustic Sundays Music featuring Kaylyn Sahs, Soaring Wings Vineyard, Springfield, Neb., 2 p.m.
June 6 – Vibes Summer Concert Series featuring Hi-Fi Hangover, Village Pointe, 6:30 p.m.
June 7 – Live music at the World Music Pavilion Stage at Omaha Summer Arts Festival, 13th Street between Farnam and Harney streets, noon to 9 p.m.
June 8 – Live music at the World Music Pavilion Stage at Omaha Summer Arts Festival, 13th Street between Farnam and Harney streets, 11 a.m. to 9 p.m.
June 8 – Saturdays @ Stinson featuring The Personics, Stinson Park at Aksarben Village, 7 p.m.
June 9 – Acoustic Sundays Music featuring Magic K Acoustics, Soaring Wings Vineyard, Springfield, Neb., 2 p.m.
June 9 – Live music at the World Music Pavilion Stage at Omaha Summer Arts Festival, 13th Street between Farnam and Harney streets, 11 a.m. to 3 p.m.
June 13 – Vibes Summer Concert Series featuring The 402 Band, Village Pointe, 6:30 p.m.
June 15 – Saturdays @ Stinson featuring The Confidentials, Stinson Park at Aksarben Village, 7 p.m.
June 16 – Acoustic Sundays Music featuring The Bird-Mann Project, Soaring Wings Vineyard, Springfield, Neb., 2 p.m.
June 20 – Vibes Summer Concert Series featuring One To Go, Village Pointe, 6:30 p.m.
June 22 – Saturdays @ Stinson featuring Fisheads 30th Reunion, Stinson Park at Aksarben Village, 7 p.m.
June 23 – Acoustic Sundays Music featuring Stephen Monroe, Soaring Wings Vineyard, Springfield, Neb., 2 p.m.
June 27 – Vibes Summer Concert Series featuring eNVy, Village Pointe, 6:30 p.m.
June 29 – Sounds of Summer featuring eNVy, Shadow Lake Towne Center, Papillion, Neb., 6:30 p.m.
June 29 – Saturdays @ Stinson featuring Red Delicious, Stinson Park at Aksarben Village, 7 p.m.
June 30 – Acoustic Sundays Music featuring Dustin Prinz, Soaring Wings Vineyard, Springfield, Neb., 2 p.m.
July 5 – Vibes Summer Concert Series featuring Come Together, Village Pointe, 6:30 p.m.
July 11 – Jazz on the Green featuring TBD, Turner Park at Midtown Crossing, 7:30 p.m.
July 12 – Bridge Beats featuring Taxi Driver, Omaha side of the Bob Kerrey Pedestrian Bridge, 6 p.m.
July 12 – Vibes Summer Concert Series featuring Jason Early Band, Village Pointe, 6:30 p.m.
July 13 – Playing With Fire Concert Series featuring Thorbjørn Risager & The Black Tornado, Turner Park at Midtown Crossing, 4:30 p.m.
July 19 – Bridge Beats featuring R-Style, Omaha side of the Bob Kerrey Pedestrian Bridge, 6 p.m.
July 19 – Vibes Summer Concert Series featuring Joystick, Village Pointe, 6:30 p.m.
July 18 – Jazz on the Green featuring TBD, Turner Park at Midtown Crossing, 7:30 p.m.
July 20 – Saturdays @ Stinson featuring High Heel, Stinson Park at Aksarben Village, 7 p.m.
July 26 – Vibes Summer Concert Series featuring The 402 Band, Village Pointe, 6:30 p.m.
July 26 – Bridge Beats featuring The Personics, Omaha side of the Bob Kerrey Pedestrian Bridge, 6 p.m.
July 25 – Jazz on the Green featuring TBD, Turner Park at Midtown Crossing, 7:30 p.m.
Aug. 2 – Vibes Summer Concert Series featuring Hi-Fi Hangover, Village Pointe, 6:30 p.m.
Aug. 1 – Jazz on the Green featuring TBD, Turner Park at Midtown Crossing, 7:30 p.m.
Aug. 2 – Bridge Beats featuring On The Fritz, Omaha side of the Bob Kerrey Pedestrian Bridge, 6 p.m.
Aug. 30 – Saturdays @ Stinson featuring The 70s Band, Stinson Park at Aksarben Village, 7 p.m.
Aug. 9 – Vibes Summer Concert Series featuring The Personics, Village Pointe, 6:30 p.m.
Aug. 8 – Jazz on the Green featuring TBD, Turner Park at Midtown Crossing, 7:30 p.m.
Aug. 9 – Bridge Beats featuring Heartland Boogie Band, Omaha side of the Bob Kerrey Pedestrian Bridge, 6 p.m.
Aug. 10 – Saturdays @ Stinson featuring Charm School Dropouts, Stinson Park at Aksarben Village, 7 p.m.
Aug. 15 – Jazz on the Green featuring TBD, Turner Park at Midtown Crossing, 7:30 p.m.
Aug. 16 – Bridge Beats featuring Lemon Fresh Day, Omaha side of the Bob Kerrey Pedestrian Bridge, 6 p.m.
Aug. 24 – Saturdays @ Stinson featuring Lemon Fresh Day, Stinson Park at Aksarben Village, 7 p.m.
Aug. 24 – Playing With Fire Concert Series featuring Indigenous, Turner Park at Midtown Crossing, 4:30 p.m. Check out our guide to our favorite outdoor concerts for kids here. We even have a guide to bringing kids to Jazz on the Green at Midtown Crossing here.